I really enjoy the site! Attached are pictures of my two year old male, Mac. Mac was a handful for the first year, but has since gone on to be the best shepherd I have ever had. Mac really loves to work, but we have not had time for schutzhund since I started back to school last fall. Mac requires lots of daily physical and mental exercise as well as plenty of attention. Mac had a brother named Angus, but Angus went on to a career as a search and rescue dog with a volunteer fire department. Thank you for creating a great resource for GSD owner's. 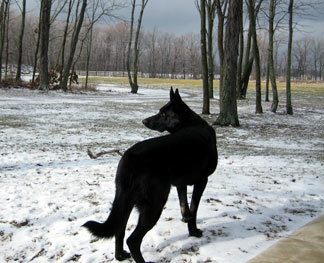 Mac, is a very handsome black German Shepherd. You can see in the picture how proud he is and how alert checking out everything. He has to make you very happy. Congrats on a great GS.